VESS 60 m³ / HOUR – CONCRETE PLANT: Machine is designed with fully automatic operating system. Designed to work 24 hours. This is the system to make concrete from mixture of Aggregate,Cement,Water and Concrete additives with specific ratio. System starts operation with doing dosage. Electronic weighing belt under the hopper weigh the aggregates and take them on the belt. In the same time the cement,water and additive weighing operation made in their special region. In the second part , the dosaged products transfers the mixer and starts mixing. In the last part, ready mixture transfers to transmixer under the concrete batching plant sending hopper this operation finishes with loading of requested volume of concrete. In an hour it can produce 60 m³ Concrete. 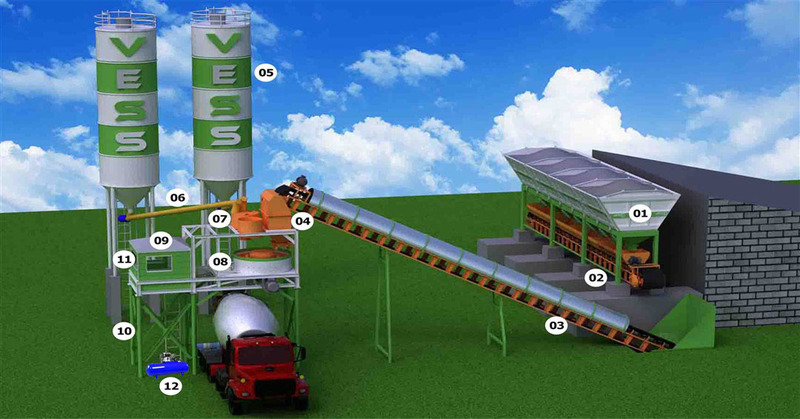 VESS 60 m³ / HOUR – CONCRETE PLANT : The price of the campaign is prepared as complete plant “Turnkey Project. For a plant with these features the recommended curing and stock area should be minimum 1.500 m2 There is no obligation for roofing. The prepared concrete floor should be minimum 1/5 of the total plant area.